It all started with a text from my friend and oft-Skinny-Girls sidekick, Dan. His wife was out of town, he was at home with the kids, did we all want to get together over the weekend? Turns out my wife was going out for a “girl’s night” for a pal’s birthday on Saturday, and Dad’s Night was ON. To make it an official Dad’s Night and not merely two wifeless guys hanging out, we needed a third dad. So the invitation went out to Jon, another nearby pal with no wife and two kids. Next came a volley of texts between Dan and me about what the menu would be. Here, first and foremost, is where our path diverged from that of a typical guys’ night. 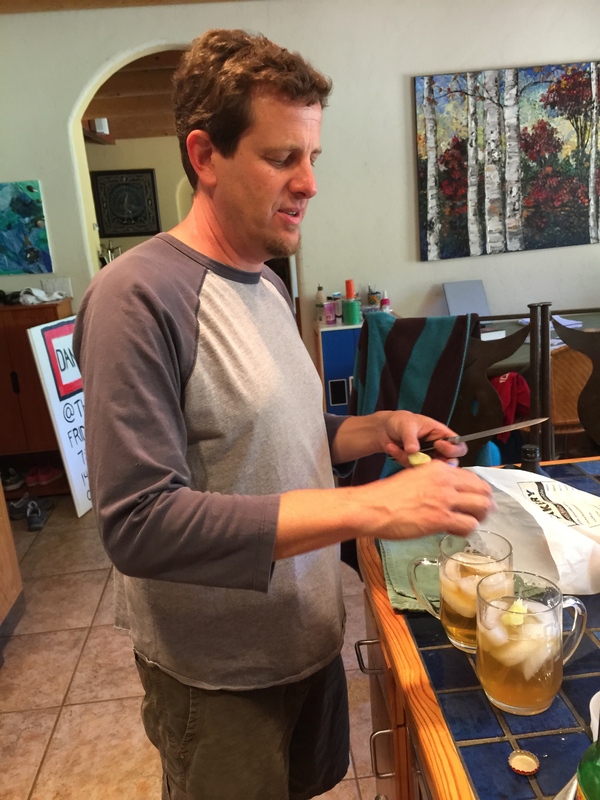 As is often the case when Dan and I (and usually our wives) are dining together, we bounce ideas back and forth about whether to go Thai, Mexican, Caribbean… Dan was talking Latin, he was planning carne asada and some plantain dish he’d had on a recent vacation to Costa Rica. I’d bring stuff for fried cheese and shrimp tacos to start the meal. Pal Jon, who is always good for a culinarily low-brow contribution or two (see Jon’s Coke-and-Jack-Daniels sausages), arrived with Tostito’s jalapeño cheese dip and some thick, soft frosted-and-sprinkled cookies in a plastic container from the bakery aisle in the grocery store. There was a voluptuous young blonde in a bikini lounging with a baby in the pool when we arrived. Jon and I joined her with our drinks while quietly protesting to Dan that she was messing up our effort to have Dad’s Night. After awhile, the mom split and we were in business, commencing drinking with a focus and seriousness befitting men left alone. 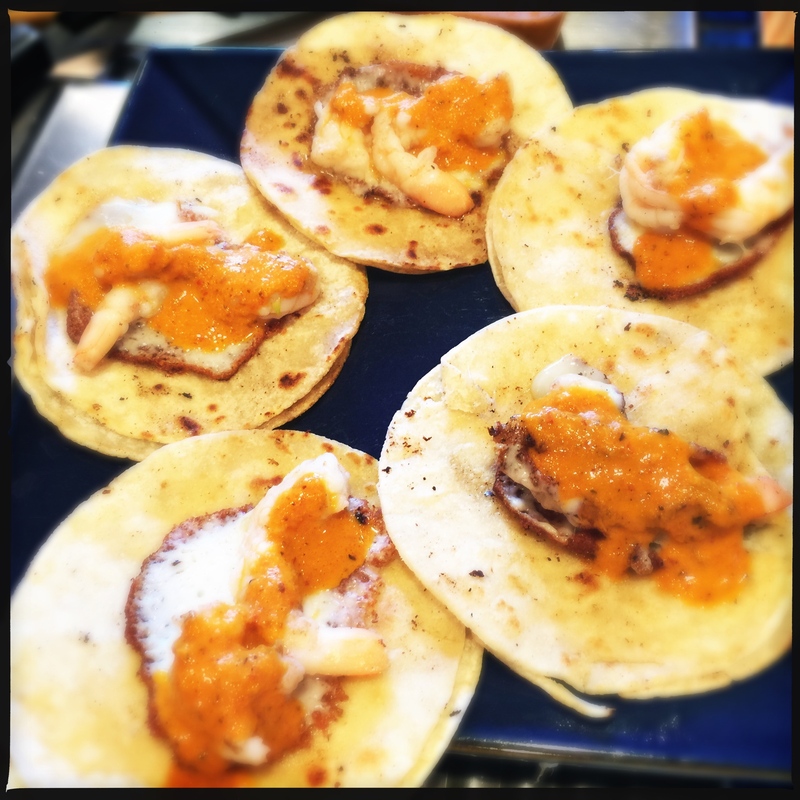 I grilled shrimp and melted cheese and wrapped them in toasted tortillas with a tangy spicy orange salsa, and they were a hit — a perfect convergence of corn-toasty zesty gooey shrimpy deliciousness. 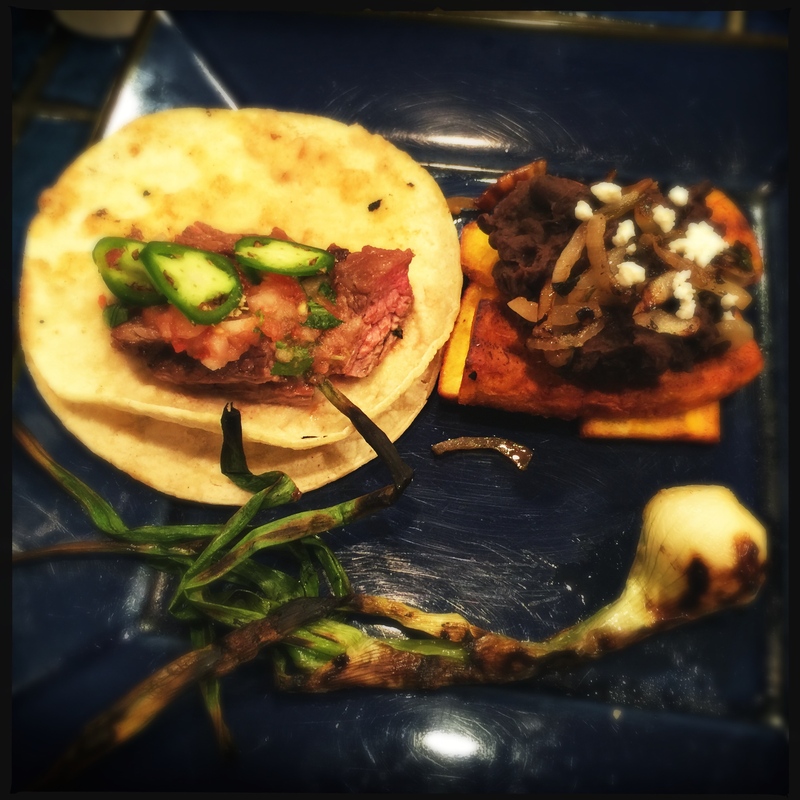 Next up was Dan, who put some beautiful slabs of skirt to the grill alongside some Mexican onions. He was also attempting patacones, the aforementioned Costa Rican plantain preparation. The kids were sedated in front of a movie, and we sat down outside to eat. The night was warm, the darkness of the state park beyond the yard providing cover for the choruses of crickets, frogs, owls and coyotes that serenaded our dinner. The steak was cooked perfectly, tender inside toasted tortillas with a bit of Dan’s pico de gallo and a squeeze of lime. He hadn’t achieved the combo of toothsome crispiness he was seeking on his Lincoln log-stacked plantains with black beans, and was disappointed. To those of us unfamiliar with the origin dish, they were perfectly executed and superb. We sat for awhile talking about something or other, putting off the clean-up that awaited inside. We stood surveying the damage — a kitchen that looked like a Texas twister had passed through. We glanced at each other and shrugged, not sure what exactly had happened. And in the interest of harmony in Dan’s marriage, got to work. The kids were tired, a couple had already dropped off, it was time to call it a night. 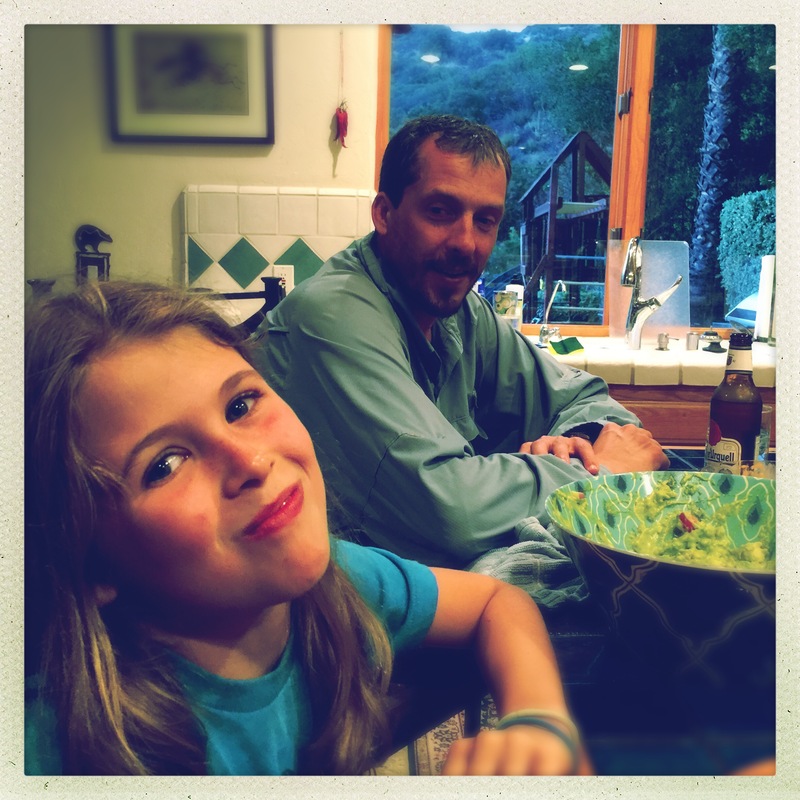 The clock was pushing 9 p.m. — that’s how Dad’s Night in Topanga goes. With the flat side of a chef’s knife, flatten out the shrimp lengthwise, gently crushing the tails so they won’t curl up when cooked. Toss together onion and cilantro to combine. Double up tortillas together so you have 12 pairs. Heat a large pan brushed with oil over medium high heat. Doing several at once, toast the tortillas about 30 seconds per side. Stack them as they come off the pan, wrap in a dish towel and keep warm in a 150-degree oven. Heat a pan over medium high heat, and melt 1 tbsp. butter. Cook half the shrimp until just translucent. Separate equidistance from one another, and place a heaping tablespoon of cheese on top of each. Let cheese melt and begin to crisp in pan. Remove pan from heat, let sit for a minute, and then scoop out shrimp/cheese clumps one by one. Place shrimp/cheese clumps in the center of doubled-up tortillas, and place on a plate in a 150-degree oven while you do the same with the remaining shrimp and cheese. When all tortillas have been filled with shrimp/cheese, sprinkle some onion/cilantro mixture over the top of each, and drizzle each with salsa. Serve. Place tomato, cut side down, with onion on a piece of foil, and broil in the oven (or toaster oven) until skin begins to char. Remove and let cool. In a pan, heat 1 tbsp. oil over medium-high heat. Toast garlic in oil for about 1 minute, turning, until it begins to turn golden. Add chiles and toast for another minute, until they puff and begin to darken. Remove from heat. Place tomato, onion, garlic and chiles in a blender with water, vinegar and salt. Puree until smooth, and then with blender still running, drizzle in oil in a slow stream to emulsify. Place in a container in the fridge. Salsa will keep for two weeks. What a charming post! Nice to know what Dad’s night means nowadays. Fried cheese tacos?! My heart just skipped a beat. Need this in my life immediately. Yes indeed! You need this. Makes me wistful for the Topanga life. Give my best to Dan! I need to be on your “Dad’s Night” short list! Love to have ya, Noel!